I've done plenty of BWCA and plenty of winter camping, but never both. Next weekend I am heading up north and snowshoeing into the BWCA for a solo trip. I will doing the canvas tent/stove combo for the first time also. I can't wait to be winter camping in a warm tent. Anyway, I'm having a hard time deciding on where to go. I want to be somewhat isolated. I don't want to hear snowmobiles or have them zipping by my camp. I also would like to find some lake trout. I'm all ready for that and would like to be able to catch some fish while up there. Trout is not a deal breaker, but it is a lot of fun. I'm picking my tent/stove combo up in Duluth and then my mind is open from there. I've got 10yrs of maps to look over but its hard to pick a spot cause I've never done it in the winter. On the Gunflint side, at least for me, it's tough to get far enough back in there to not hear them at times. I just don't let it get to me. Then again, I'm partially to blame because I'm not big into hoofin in too far. Lots of places to go (Ely end) and with people out and about, should be able to find some traveling without big slush problems. Lake trout, unless you're willing to travel a long ways, can be a problem. Thomas Lake over the winter trail from Snowbank is probably your best bet, but is about 12 miles one way. You could go up the Moose Lake chain to New Found, portage off into Found and camp there. Found has brookies in it and is pretty quiet. There is a portage from Found to Manomin Lake and then onto Rice Bay of Basswood which puts you within a couple of miles of lake trout water by Beaver Island. Could go all the way and camp, or camp on Found and day trip it to Beaver Island (Bayley Bay). Also from Moose you could cross over to the Wind Lake portage and go into Wind Lake. No lakers in there but the northern fishing can be phenomenal. Try around the island in front of you as you come onto the lake from the portage. Duncan and daniels are pretty easy to get into to with decent fishing and if you wanted to get further in you could try rose, all three have lakers. Man, I read the topic and know it would only be a matter of time before Duffman jumped in on his favorite topic!! Gunflint is always sweet. I would have a hard time not heading up to basswood though. If you go up far enough lakers are good, otherwise there is always plenty of walleyes. The suprise about the lake is the crappies that are in there. Back bay is always good for that. I don't know if it's my favorite topic, but it's up there. I have more fun whining at the whiners in other forums. I don't know when you plan on going, if regular fish season is closed, you could always chase stream trout as well as the lakers. Regarding what you are looking for, I would try a trip into Tuscarora off the Gunflint. You can make it in a day. Pretty flat to Missing Link but hillier to Tuscarora. That will be a little trickier. A beautiful lake to camp and fish on. 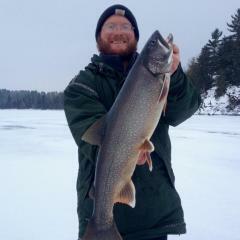 Pretty fair lake trout. You might see some dogsledders--certainly no snowmachines. I was just going to suggest Tuscarora also. Its not that far in but you'll be away from it all and if you want to day trip to Gillis its and easy one. If its lakers you seek you'll find them there. Not really know for size but its got numbers, numbers good enough to plan meal when your survival might depend on it. One guy and a canvas tent and stove + food and gear, you'll be freighting in. A good toboggan is in order. Narrow and long is the name of the game. I'd imagine the trail in will be packed but once on the lake you might be slogging gear. If you have a dog which I think you do, harness him up and make him pull for you. Besides pulling most or all the weight he'll be good company for you. I've done solo trips and never had this problem but your at the ripe age for them. Panic attacks, being solo your mind can play tricks on you and be your worst enemy, as long as your aware of that and can settle yourself thats all I need to say there. Even though you have a tent and stove, the stove will not burn all night. Plan on a bag that will keep you warm if your tent should fail. Drink plenty of water, mix it with anything that is caffeine free. I may bring the dog, but I'm unsure if he'd haul gear. I'm going up this friday, the 13th!!! I've made the tuscarora trip in the summer.....never thought of that. That might be my choice. I've got the maps and I've traveled the route before. I love winter camping.....I'm gonna have more gear (weight and volume) for a solo winter trip than I would bring for a week for 4 ppl in the summer. As you pull your tobbagon in the hilly sections you are going to figure out how to get your sled down the hills. A long rope tied to the back will help with this. Wrapping the rope around a tree will give you a brake and ease the descent. You probably won't be able to make it to the access at Round Lake. You'll probably have to park at the turnoff on the way to Tuscarora Lodge. We've never tried parking at the Lodge but they might give you permission to do so (?) and that might get you on the lake a little sooner. There is usually a marked trail on the lake leading to the entry point. There's a nice article in the Minnesota Conservation Volunteer from a while back and the BW Journal has had articles on it as well. I'll have to look for those back issues. I've got the BW journal around here. I took the dog out today and put his pack on. He has a saddle bag harness that he uses in the summer to carry his own food and toys. It has a large leash hook on the back so I hooked him to a sled with about 20lbs on it and he did very well. We went on a long hike and he loved it. I'm gonna try it again on tues and wed. So far so good. That would be awesome if I could dump 30-40lbs on the dog. I might call up to tuscarora and see what they say, or maybe call the rangers in Grand Marais. If you hook your dog up with a harness to pull a sled, have a rope on the end of the sled and hang onto it on the portage from missing link to tuscarora. Steep portage and your going to have the sled running up your dogs backside if your not careful. It'll spook the dog and make him not want to pull for you. Now that's a great tip from someone who must have some experience! Have fun Powerstroke, and please fill us in on your adventures when you return to civilization. This is something that I've been pondering myself, and if I don't do it soon.....pert soon I'll be to danged old to try! Have a blast and be safe out there. Have a great time Powerstroke. I'm curious to hear how the trail and lake conditions are after this recent warm spell/rain. The road into Round wasn't plowed on last years trip to the area, added an additional 3/4 of a mile to our trek. My 9ft toboggan was somewhat of a pain to deal with on the downslopes of the trails. That first stretch of the portage into Missing Link from Round will get your blood pumping. Powerstroke, you might want check on conditions up on the Gunflint. If they had the same amount of rain we have, travel will be very difficult. We got the rain thats for sure! Everything is a mess! Sloppy and deteriorating! Sounds like it will be fun, i know im making my first winter camp trip into canada out of the saganagons here pretty quick... probably after we get some more snow so we can run the snowmobiles to camp a little easier. So does that mean I should probably postpone the trip? I guess I'll call up to Tuscarora Lodge again. Let us know what you find PowerStroke! I'm planning on heading up the trail this weekend. Curious if I need to pack the waders! Its supposed to cool down, question is will you be able to stay on top or will you be busting a top crust the whole way. If you decide to still go I'd be bringing snowshoes for sure. I agree with Frank. Snowshoes for sure as a precaution. At my house yesterday evening, when it hadn't gotten below freezing for two full days/nights and the rain was finishing, the snow in my back yard (about a 2-foot snowpack) was wet and melting from the surface all the way down to the ground itself. So when it cools off tomorrow, the cold ground will begin to freeze the snow from the bottom and the cold air from the top, and I'll bet within a few days it'll firm up the whole snow column and after this weekend's single digit lows and highs in the 20s, it'll be strong enough so it'll be like walking on a parking lot. But of course the snow up the Gunflint may not have gone wet all through the 3 feet or so that had fallen, and so you could have the crust issue Frank mentioned. With luck, if you don't postpone the trip a week or two and do go in a few days, any crust will have stiffened up enough to hold you. It's really amazing how little hard crust it takes to keep my 250 lbs from breaking through the crust when I'm wearing snowshoes. I haven't heard back from Tuscarora yet, but I'm going full steam ahead. The lakes and ponds froze up here last night so I am sure they did the same up north. I will have the snowshoes for sure and I already planned on wearing my knee-high rubber boots while shoeing so I should stay dry. I will give everyone a recap when I return. there is nothing like the b-dub in the winter time. Like previously mentioned our snow as well was a total melt from bottom to top... all 3 feet of it! now if you can get on some trails previously made after this freezeup in the next week youll be golden! Everything is still a sloppy mess though... Come on -40!!!!! We really need some of that cool weather to firm things up again. Ya i doubt much is happening around tuscarora when i headed down the trail this morning things looked pretty quiet around there...? Maybe there just shoveling that 3 inches of garbage snow we got last night... Well good luck and wish ya woulda decided to come all the way up the trail to sganaga so we coulda chatted!